Ashura Hemed knew soon after her son, Shadrack, was born that there was something wrong with his eyes. They looked larger, were watery and he hardly opened them. Ashura visited the local reproductive and child health clinic five times over three months. Not knowing how to examine Shadrack, the child health care workers either ignored her questions or gave her antibiotic eye drops. Ashura and Shadrack live in Tanzania but many mothers face such problems all over the world. Primary eye care services for children are patchy at best and non-existent throughout many low- income countries. This leads to delayed presentation to eye care services–sometimes by many months or even years. On one of my visits to Dar es Salaam, I found two 7-year-old girls—twins–waiting for their operation for bilateral congenital cataracts. Unfortunately, these kinds of delays are sight-threatening and lead to very poor visual outcomes after surgery. Children under 7 years are a particularly vulnerable group as their vision is still developing and any obstruction to vision, such as cataracts or corneal scars, will harm their visual development. This could lead to lifelong visual impairment or blindness, even if they are treated when they are older. To address this critical issue of late presentation, we looked at how to improve primary eye care services for children in low-income countries. We found that children under 7 years are frequent users of primary health care service–perhaps more so than at any other time in their lives. They are seen at child health clinics for vaccinations, monitoring and any type of childhood illness. Therefore, we decided to see how we could include eye care into child health care services, so as to provide holistic solutions for the mothers and their children. In 1995 WHO and UNICEF jointly launched the global programme, the Integrated Management of Childhood Illness (IMCI), which later included neonates (IMNCI). This is now established in over 100 countries and a recent review by WHO pointed to the programme’s successes while advocating further integration with other child programmes. This is a modular programme which includes ears but does not include eyes. We decided to develop an eye module and a training programme which could be included and therefore used to train primary child health workers. This process began in May 2017 in Tanzania when we first formed a steering committee with the Ministry of Health (MoH), WHO, UNICEF and active NGOs in the country. 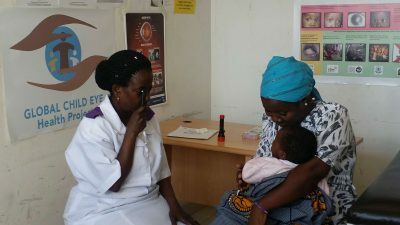 We started in Tanzania since a local ophthalmology leader, Dr Mafwiri, had been working with our team since 2007, having done both a pilot study and formative research on child eye health care. When we presented our research results and our aims, the Ministry of Health (MoH) was immediately very supportive. They had considered this previously but the timing was now just right with the expansion of their IMCI services and training. Importantly, countries have some local control with what they can include in their IMCI programmes and how they can adapt them. The MoH agreed to work with us to develop the module and pilot-test it. Thus, over the last year we have been working together and pilot-tested the module earlier this year during a routine MoH training. We have faced a number of funding challenges when we changed to testing in real life conditions and working to the MoH’s schedule. We also had to produce many training materials such as training videos which we initially had not anticipated. However, this was all made worthwhile when in a national IMCI review meeting in May 2018 the MoH agreed to include our module! From now on, all IMNCI training in Tanzania will include eye care. Since May this year 1,700 staff delivering IMNCI have, or are being trained in IMNCI in 6 districts in 3 regions across the country. According to MoH data these child health workers will see on average 5,800,000 children per year, who will now benefit from prevention, and treatment of eye conditions. Potentially 246,500 children with eye problems per year will directly benefit from diagnosis and treatment, of which possibly 4,930 children per year with serious eye problems will be detected early enough to be treated. However, this is just the start and we now plan to evaluate the impact of this policy change in Tanzania and expand it to other countries. Ultimately, we want WHO and UNICEF to include an eye health module in their global policy, which would positively impact children in over 100 countries. Shadrack was lucky to have a very strong mother. They also live close to Dar es Salaam, the biggest city in Tanzania. His determined mother managed to get him seen at an eye clinic and he was diagnosed with congenital glaucoma. He is now doing well and remains under follow-up care. He was one of the lucky ones. Hopefully in the future, luck and a strong mother will not be needed and all children will have access to primary eye care services with prevention, treatment and early diagnosis – so no child will needlessly lose vision.